Spring is in the air (though the weather forecast might disagree), and that means it’s time for lacrosse here at Swarthmore. The women’s lacrosse team has surged out to a 9-3 record behind a high-powered attack and stingy defense. It has been the junior class blazing the way for the Garnet this year. 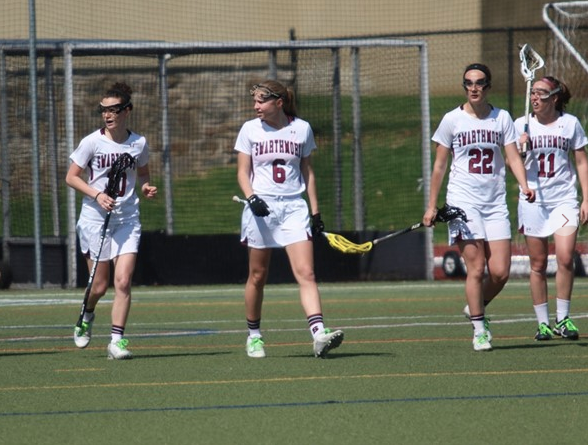 Tess Wild ’19 has scored 20 goals and 20 assists on the season, and broke the career century scoring mark during an 18-5 win over Widener in late March. Eliza Wainwright ’19 is the team leader in goals with 27, one year after a 51-goal campaign (60 points total), and is also over the 100 career points mark. Kathryn Restrepo ’19 has returned in fine form after spending a year abroad in Spain, which included a stint playing for the Spain Women’s National Lacrosse Team. She scored 60 goals during her first two years with the program and has chipped in 17 goals and 11 assists this year, leaving her just 3 points shy of 100. The Garnet have maintained a fairly democratic attack as no player has scored over 30 goals and 11 have scored at least 5 goals (with at least four games left to play). Last season, three players broke the 30-goal mark while only eight managed to score at least 5. Sophie Peipher ’20 and Bridget Silveira ’20 have been great beneficiaries of this expanded attack as Peipher has scored 15 times, after only 5 goals last year. She has especially picked up the pace of scoring in recent games, recording a hat trick against Bryn Mawr and Widener and a brace against Arcadia and Dickinson. Silveira has also seen her scoring blossom to 10 goals after last year’s five-goal campaign. Some first-years have also had the chance to play important roles on the team. Midfielder Julia Ostrowski has tallied 5 goals and 5 assists, and has started all 11 games she’s played in. Mackenzie Frost has yet to start a game, but she has scored 15 goals, good for fourth on the team. On defense, the seniors have helped to lead the way with Christina Labows ’18 and Emily Sokol ’18 providing a fearsome presence around the cage. Sophomores Sadie Camillierie ’20 and Sara Mongno ’20 have also figured prominently in the defense. Betsy Cohen has stood tall in net (in spite of her listed 5-foot-1 height) and sits third in the conference in goals against average. All of this has come together to lead the Garnet to their 9-3 record. However, the Garnet still are on the outside looking in for the Centennial Conference playoff picture, as they currently sit one game back from Haverford and Dickinson for the fourth or fifth seed. All three of their defeats have come at the hands of Centennial Conference opponents, include top-10 ranked Franklin and Marshall and Gettysburg, the No. 1 team in the nation at the time, leaving them at 2-3 in the conference. However, should they maintain their electric attack and defensive prowess, they will surely compete for their first playoff berth since 2012. The home stretch begins Wednesday night at Muhlenberg College. Men’s lacrosse has had a somewhat more disappointing season so far. One year after their second consecutive Centennial Conference playoff appearance, they have an overall winning record of 6-5, but a conference record of only 1-4, admittedly playing in one of the toughest conferences in the country. They have already played and lost to no.11 Franklin and Marshall, no.6 Gettysburg, and no.10 Dickinson, all in conference play. Perhaps their most shocking game was against Muhlenberg, where they lost 10-9 after falling behind 5-0 in the first quarter, providing Muhlenberg its first conference win since 2014 and snapping a 28-game conference losing streak. One of the biggest potential holes for the Garnet coming into the season was replacing graduated faceoff man Stephen Ducey. Ducey maintained a .569 faceoff percentage through his four years at Swarthmore, including a monster .644 percentage performance during his senior season. So far, Ryan “Rhino” Izquierdo ’21 has done well to fill his shoes, winning 58 percent of his faceoffs through 11 games played. The Garnet have really lacked a dominating attackman this season, a role that Cam Marsh ’18 filled last year in scoring 36 goals and 24 assists. This year, he has been quieter, preferring to open opportunities for his teammates as he has tallied only 13 goals but 20 assists. Austin Chang ’20 has tried to fill that role, already nearly matching his 25-goal output from last season with 23 so far, but does not provide the same volume of assists that Marsh did. Jake Ross ’20 has chipped in 17 goals and 6 assists, while Zander Levitz ’20 rounds out the list of players scoring in double figures, as Levitz has netted 11 while assisting on an additional 9. Mason Evarts ’21 has been a standout first-year with 6 goals and 6 assists in 11 games, while Andrew Estella ’21 leads all long-poles with 3 goals scored, including a ferocious shot during the Garnet’s loss to Dickinson this past Friday. Although the Garnet have been mathematically eliminated from the playoffs, they still have an exciting home game remaining against arch-rival Haverford on April 28. I would love to see the mathematical proof/analysis that brought rise to this sentence.